Here it is, the 2019 Suzuki Jimny—the next generation of one of the closest modern off-road billygoats to the original Willys Jeep. It’s supposed to launch sometime this year, but until then, enjoy these spy shots of what Suzuki has confirmed is indeed the 2019 Suzuki Jimny. Back in October, I wrote a story claiming that a rendering of the 2019 Jimny—one that was based on spy shots of a camouflaged mule—revealed a design that was basically “perfection.” It’s good news, then, that new spy shots recently posted to Instagram show a vehicle that looks essentially just like that rendering. That is to say: The new Jimny looks awesome. We don’t know exactly who took these pics; a number of other car websites are giving the photo credit to Instagrammer Suzukinfluencer, while others say credit belongs to a Facebook group called Ferdfanpage and still others say the photos come from Japanese car blog creative311, while creative 311 itself is giving credit to Instagrammer hiroto. I’ve reached out to all the sources, with Ferdfanpage giving me a cryptic and meaningless response, Suzukinfluencer granting me access to use the photos (though not saying if he/she took them) and dead silence from the others. In any case, Suzuki has confirmed that the photos do depict the new 2019 Suzuki Jimny, a vehicle that looks more chiseled than the outgoing model, with sharper lines, and a boxier overall profile. It looks a bit like a miniature Hummer H2, except a lot less gaudy. The beauty of the Suzuki Jimny has always been its combination of off-road features—like a body-on-frame architecture, a two-speed transfer case and solid axles—and small size (the Jimny started off in Japan’s Kei car class of tiny cars, after all). As vehicles like the Jeep Wrangler got fatter and fatter over the years, the Jimny—like the original Willys flatfender Jeeps—has remained tiny enough to fit between narrow openings in trees and boulders, offering the ultimate recipe for off-road capability. This new generation, which is replacing the outgoing one that’s been around since 1998, appears to hold onto that formula. 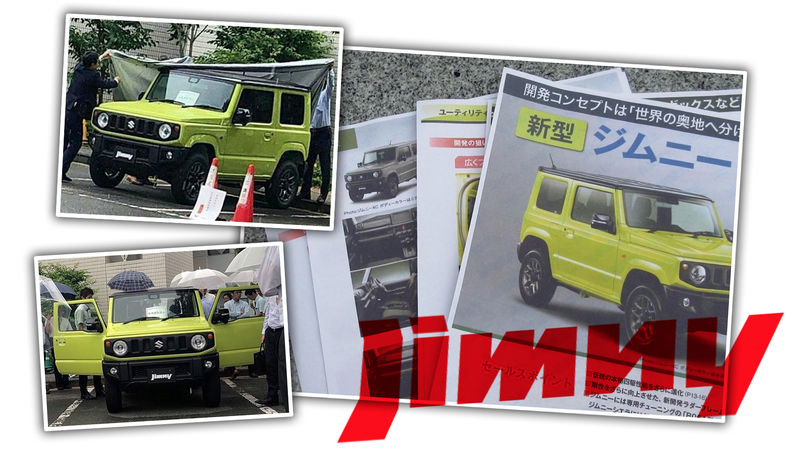 Photographed at a dealer preview according to Japanese car website creative311 says, the new Jimny should come with three engine options: a 660 cc inline-three turbo, a 1.0-liter inline-three turbo, or a naturally aspirated 1.2-liter inline-three. Creative311 also seems to mention a 1.5-liter naturally aspirated three-cylinder, though I see few other mentions of this motor elsewhere on the vast interwebs. The Japanese website says transmission options will include a five-speed manual and a four-speed automatic. Australian car blog Motoring.au claims the new Suzuki off-roader should also add some electronic gadgetry to its off-road portfolio, including hill descent control, hill start assist and a special off-road stability control mode. So basically, the 2019 Suzuki Jimny should be a boxy, tiny off-roader that most likely is body-on-frame and equipped with two solid axles. What more could anyone possibly want?